Performers include: Paul Blackthorne, Valerie Cruz, Terrence Mann, Raoul Bhaneja, Conrad Coates, Matt Gordon, Jonathan Higgins, and Daniel Kash. 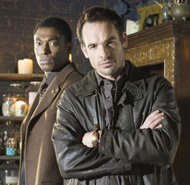 Based on Jim Butcher’s best-selling novels, the sci-fi series tells the story of Harry Dresden (Paul Blackthorne), a regular-guy private detective with extraordinary wizard abilities. Whether consulting with police Lieutenant Connie Murphy (Valerie Cruz) on strange crimes or following his own cases, Harry battles dark forces with a wry sense of humor. Other characters include old spirit Hrothbert “Bob” of Bainbridge (Terrence Mann), High Council Warden Donald Morgan (Conrad Coates), skeptical detective Sid Kirmani (Raoul Bhaneja), and medical examiner Waldo Butters (Matt Gordon). Why is this show so bad? Enjoyed this series so much! Even my 15 yo daughteer loved it. We used to watch this together each week,until it ended. Then we statrted watching Blood Ties, until it ended. Maybe we’re the angels of death to TV series? Would love for a second season to both of these shows.